Extract from U.S. Department of Agriculture publication 1906 . "FOREIGN TRADE PRACTISES IN THE MANUFACTURE AND EXPORTATION OF ALCOHOLIC BEVERAGES AND CANNED GOODS." cereals, such as rye, wheat, and oats. Indian corn, apparently, is not used at all, or at least only to a limited extent. The malt which is used is not dried over peat, and hence the Irish whisky does not have that smoky taste so characteristic of the Scotch product. Usually, when unmalted grain is used, malt makes up about one-half of the whole mash. The other half consists largely of unmalted barley, very small quantities of rye or oats, or both, being used. The mashing, the cooling of the wort, and the fermentation are conducted as in Scotland. The distilleries are or great capacity, and the vats and stills correspondingly large in size. For this reason the pot stills, altho usually heated over an open fire, are reenforced by steam coils. The method of distillation is the same as in Scotland, but the whisky is warehoused at a much higher proof, viz, about 67 per ecu-; by volume. Practically all the beer stills are supplied with a horizontal attachment to the neck before the pipe enters the worm, where a partial condensation takes place, this product being returned directly to the still, thus producing low wines of greater alcoholic strength. The finished product is thus secured with a higher per cent of alcohol. The accompanying illustration (fig. 4) shows the form of the stills used at two of the Dublin distilleries. Pot stills of the type shown as No. 1, figure 4. ; holding from 19,000 to 25,000 gallons each, under which 50 tons of coal a day are burned. In addition to the open fire each still, except the spirit still, has an. auxiliary steam coil. The stills are in batteries of four, two for producing low wines, one for special treatment of the feints, and one low wine still for the purpose of making the spirits of the proper strength. The extra concentrating still for the feints is required because Irish whisky is distilled at a very high proof, namely, 49 over proof British. It is bonded at 25 over proof British, much stronger than the Scotch whisky, which is usually bonded at 11 over proof. It will be noticed that the stills have rather high necks, curving down into a long horizontal portion lying in a trough surrounded with cold water. The condensation is returned to the still from this horizontal condenser in a continuous stream. It is evident that the triple distillation of the feints and the cooler attached to the horizontal portion of the neck secure the return of a considerable portion of the heavy alcohols to the still and their final removal in the burnt ale. 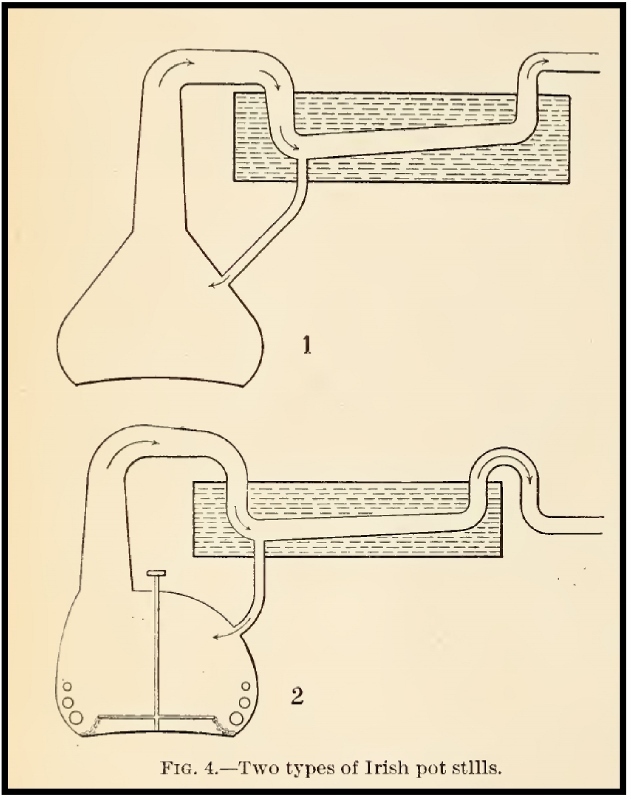 At another Dublin distillery presenting the same general type of still the rouser or stirrer enters directly at the top of the still, the neck being placed at one side to make this arrangement possible (fig. 1, Xo. 2). 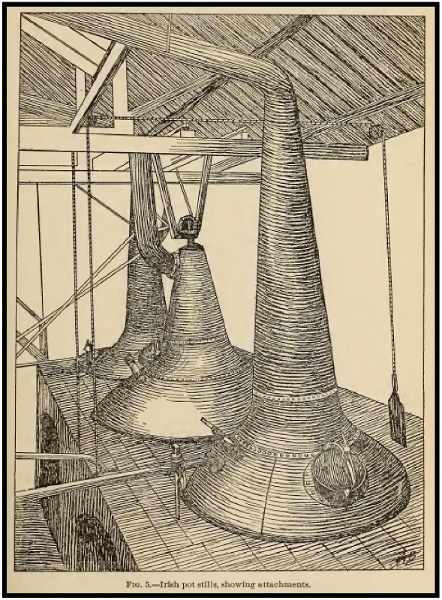 A general view of some Irish pot stills, showing attachments, is given in figure 5. There are grain spirit stills also in Ireland, and one of these in Dublin was visited. It is claimed in this distillery that the production of grain spirit is incidental to the manufacture of yeast,which is the principal product, the grain spirit being a by-product. Immense quantities of yeast are made at this distillery and supplied to bakers all over the United Kingdom. Indian corn, converted with malt, is the grain chiefly used. It is said to give a better yeast than can be produced from any other cereal. Mixing and compounding warehouses are also found in Ireland, but it is claimed that a great deal of Irish whisky , guaranteed to be genuine, is bottled strictly for the export trade to the United States. It is only fair to say, in respect of these so-called blended goods, especially " Scotch whisky," so called, that the compounders express an entire willingness to label such goods " blended" or ' ; compounded " should our regulations require such a designation. It is stated that the genuine Scotch whisky, while it can be drunk with impunity in the Highlands, is not suitable for consumption in London and other parts of the Empire without being softened by admixture with a spirit of low flavor. The compounders would not like, however, to put upon the label the degree of dilution practised, nor to name the diluting spirit. Compounds are made of from 20 to 80 per cent of grain spirit, according to the price the customer is willing to pay. Every vat compounded is accurately described in the books of the excise officers, so that an official certificate could be given were it in harmony with the regulations. Similar books are kept also by the compounder. Both sets of books were freely shown.